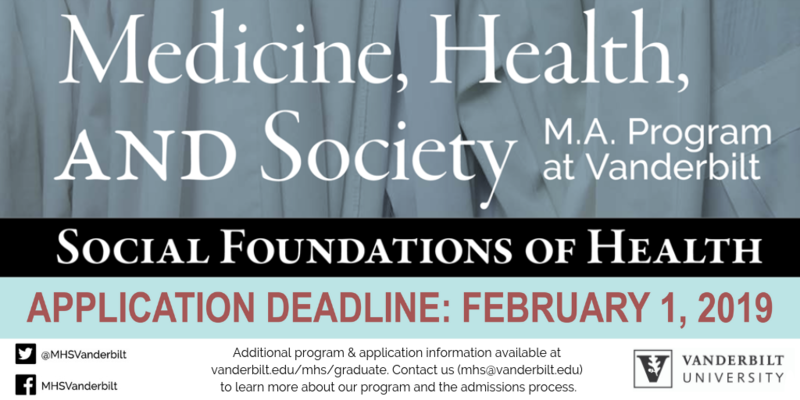 Vanderbilt University’s Center for Medicine, Health, and Society (MHS) is currently accepting applications to our one-year accelerated MA program in the Social Foundations of Health. The MA in MHS emphasizes critical perspectives on health and illness, health disparities, and health justice– each approached through interdisciplinary research. Students in the MA program collaborate with faculty on humanities and social science research through the Graduate School as well as clinical research in Vanderbilt’s Medical Center. The MHS graduate program offers a one-year accelerated program of study, with the option of completing a thesis or practicum. Opportunities for employment as teaching assistants are open to students in this program on an as-needed basis. Students often complete the MA before going on to jobs in research, public health, non-profits, and healthcare consulting or as part of a “gap year” before medical school or other health-related advanced degree programs. Applications for the 2019-2020 academic year are due February 1, 2019. Students seeking additional information about the program are welcome to follow up with MHS@Vanderbilt.edu.